Fatehgarh Army Rally Bharti 2019 The Date of Recruitment Rally For Fatehgarh Army Bharti is Starting from 23 April 2019 to 29 April 2019. Applicants who are from Rajasthan and Uttar Pradesh should produce themselves with good physically fitness, medical Test at the marathon running of Army Fatehgarh Bharti 2019. 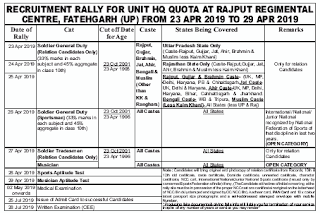 Fathgarh Army Bharti Date 2019: Recruitment Rally For Unit HQ Quota at Rajput Regimental Center, Fatehgarh (UP) FROM 23 April to 29 April 2019. Candidates should bring original and Photocopy of original documents of 10th, 12th etc below the document. 1.Highschool pass certificates, 12th pass. 6.National and Internation Sports Related Certificates. 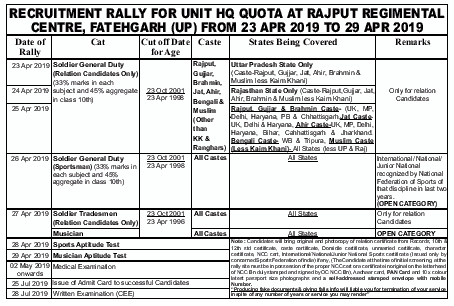 Fatehgarh Army Recruitment Rally 2019: Latest News 1 April 2019 Below are date of recruitment in Fatehgarh UP Sena Bharti with cut off marks on age related criteria. UP Fatehgarh Sena Bharti 2019: From army Bharti UP Fatehgarh on the date of 25 April all states candidates can attend this bharti that we have written on time table pattern. Bengali Caste: West Bengal & Tripura. Muslim Caste Army Recruitment Rally in India: All states UP & Rajasthan.